The NVLT examines a subject's ability to remember memory material that is difficult to verbalise. It may be administered both to healthy subject and to patients with cerebral defects for the purpose of assessing specific memory disorders. In combination with its verbal equivalent, the Verbal Learning Tests (VLT) it can be used to assess material-specific learning disorders in the diagnosis of amnesia. The NVLT has been designed as a test procedure assessing learning ability with respect to non-verbal memory material that is stored in a material-specific long term memory store. The test is based on memory theories by Atkinson and Shiffrin and by Braddley as well as findings from neuropsychological research into amnesia. Previously learned information is retrieved by the recognition method. After a practice phase 160 (in the short form 120) nonsensical figures - some geometrical, others irregular - are presented to the subject on the screen. Each figure is displayed for 3 seconds. In the course of the test 8 of the figures shown are repeated a total of 7 times (5 times). 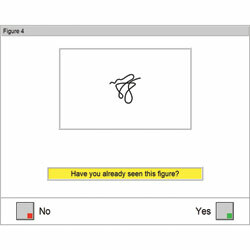 With each figure the testee must decide whether it had already appeared before or whether it is shown for the first time. Responses are entered by pressing one of the two reaction buttons that are provided for the two answer options. After an answer has been made it may still be corrected. One long form is available with 160 items and one short form with 120 items. The program records the number of correct Yes answers (SUM.RJ) and the number of incorrect Yes answers (SUM.FJ) as well as the difference (SUM.DIFF) between these two parameters for each learning block and as the sum total over all of the blocks. In addition, the development of these three variables over the 7 learning blocks is shown. A so called "instability index" (LabIndex) is provided as a measure for the stability of learning performance. Split-half reliability coefficients were computed on the basis of data from 811 subjects of the normalisation sample. These were between .835 and .914 for all parameters of the long form of the NVLT and between .804 and .897 for the short form. All of the reliability parameters are practically invariant, i. e. their 95 % confidence interval is < 0.1. Construct validity was tested by analysing whether the learning curve over the single learning cycles was as monotonous as possible in terms of an Guttman scale. This was the case to 87%-95% for the repeated geometric (high-associative) items, and to 54%-64% for the irregular (low-associative) shapes. However, the number of deviations from the ideal learning course is very low for both item types. An analysis of the performance intercorrelations between item blocks showed a structure that supports the inference that only one homogenous characteristic (learning ability) is assessed throughout all the item blocks. An investigation of neurological patients with unilateral right- or left-hemisphere vascular cerebral lesions to test the differential validity of the NVLT and the parallel VLT showed that these two tests can detect material-specific learning disorders in the sense of double dissociations very precisely, not only for the groups as a whole but also in a high percentage of individual cases. A representative norm sample of N=342 individuals is available for the NVLT. The norms are available both for the sample as a whole and also separated according to educational level. In addition raw scores adjusted for age effects are available for the main variables. Between 9 and 12 minutes (including instruction and practice phase), depending on test form. The visual discrimination test takes approximately three minutes.